3 years & up. Inspire little learners to be big thinkers in a super fun way! This unique Code-a-pillar toy by Fisher Price® comes with several different color and function segments that are easy-to-connect and encourage critical thinking. 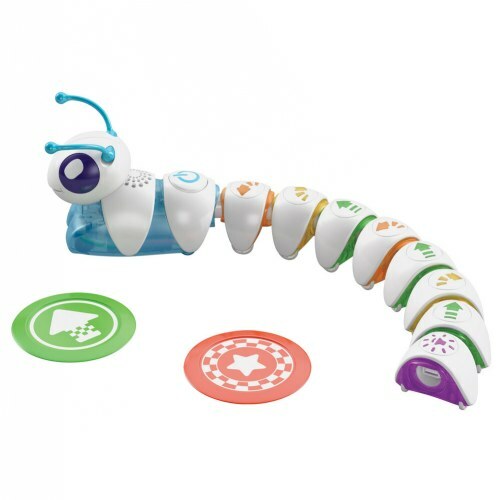 Children will learn problem solving, sequencing, and planning by connecting the segments of the Code-a-pillar in an order that allows him to move toward targets and through various obstacles on the floor. Some segments make his body move right, some make him move left, and some send him on a straight path. Each wiggle and turn incites a flashy display of lights and sounds. Made from high-quality, durable, non-toxic materials. Requires 4 AA batteries, not included. Assembled size: 16.1" x 4" x 13"